Safety Floor Stickers built in Memphis, Tennesseee USA. 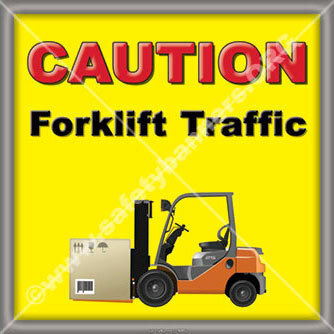 Our Forklift-Tough® Safety Floor Sticker Signs are used by most of the Fortune 500 companies! Forklift accidents are a serious problem in American industry! 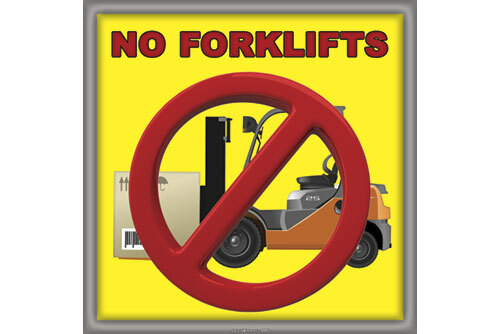 Forklifts can become very dangerous if operated by a reckless or untrained operator. 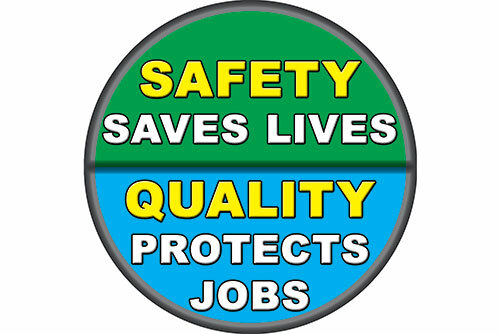 All operators should receive safety training prior to being allowed to operate a forklift. Forklift accidents tend to be very serious, involving both personal injury and damage to property. These accidents can be avoided if operators use some common sense and follow safe operating procedures. Do not operate a forklift until you have been properly trained and authorized to do so. Use the seat belt. It will keep you secured in the seat in the unplanned event of a tip over. A parked forklift should have the forks flat on the floor with the controls set to neutral and with the parking brake set. A forklift is considered to be "unattended" if the operator is more than 25 feet away or if the forklift is out of the direct vision of the operator. Unattended forklifts should be parked with the power turned off. When operating the forklift on inclines, the load should always be on the uphill side of the incline. Drive forward going up the incline. Drive backward going down the incline. When traveling without a load on the forks, keep the forks approximately four to six inches off the floor. Never allow anyone to walk underneath a raised load. Stop at all blind corners to check for other traffic in the area. This includes other forklifts and pedestrians. Honk your horn and look before you proceed. If carrying a tall load that blocks your forward vision, drive in reverse and turn your head so you can see where you are going. If operating around other forklifts maintain a three-forklift length distance between forklifts and never attempt passing. Never drive a forklift up to the back of a person who is unaware that the forklift is behind them. -- Check your overhead clearance. Keep the truck at least 10 feet from any overhead electrical wires. Watch for overhead obstructions like pipes and low doors. If they are hit while moving, a lift truck can tip over. -- Don’t forget that the lift truck has rear steering. A turn into a soft shoulder or off a curb can tip a forklift truck over. Watch the steering end of the lift truck and keep the steering wheels on the road. -- Turning too sharply with the folks raised can tip over the lift truck, even at slow speeds and with no load. Take the time necessary, slow down, and operate safely. -- There may be times when the truck is operated empty for long runs at close to its top speed. Slow way down before turning. Lift trucks are rear-end heavy because of the counter weight used to offset loads. An empty lift truck can turn over just like a loaded truck. Stunt driving and horseplay are never permitted. Forklift trucks are very heavy and inherently unstable. Safe driving must be taken seriously. Any person observed driving in an unsafe manner will have their operator certification revoked and disciplinary action may be recommended.